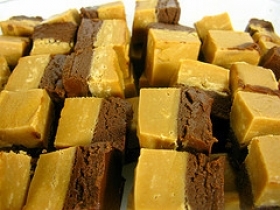 Have you made Apple-Peanut Butter Fudge? 1. Mix semisweet chocolate pieces, half jar marshmallow fluff, peanut butter and vanilla. 2. Set aside. In buttered heavy 2-quart saucepan, mix sugar and apple juice. 3. Cook and stir until sugar dissolves and mixture boils. 4. 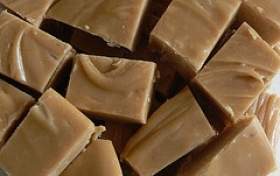 Cook to soft-ball stage or until candy thermometer registers 240 F, stir frequently. 5. remove from heat, quickly add marshmallow mixture. 6. stir until just blended. 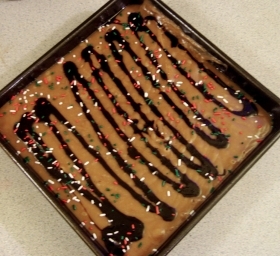 Pour into buttered 9" square baking pan. 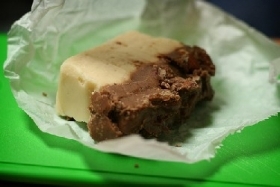 7. top fudge with chopped peanuts, if desired. cool. 8. 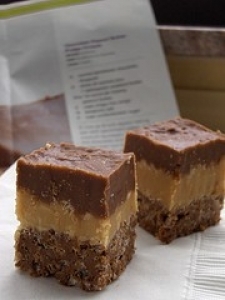 Cut into squares. Makes 3 dozen 1-1/2 inch pieces. 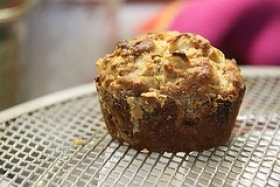 This recipe contains potential food allergens and will effect people with Peanuts, Natural Sweeteners, Fructose Malabsorption, Apple allergies.